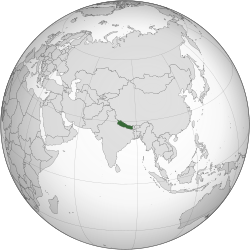 Nepal (Nepali: नेपाल) is a country in South Asia bordering the Republic of India and the People's Republic of China. Mount Everest, the highest mountain in the world, is found there, as well as the Himalaya Mountains. 12 of the world's 18 highest mountain peaks are in Nepal. It is also the birth place of Buddha. It has recently become a secular country, but it used to be the only Hindu nation the world. Nepal is a very important pilgrimage place for both Hindus and Buddhists. The population of Nepal in 2007 was almost 29 million people. Nepali is the official language, and there are many other regional languages. English and Hindi are widely understood. The capital city of Nepal is Kathmandu which has a population of over two million people. The second largest city is Pokhara. Pokhara has many lakes, including Phewa Tal. Nepal used to be an agricultural country till 1950. Since 1951 it entered the modern era and has made progress. Agriculture, however is a major economic activity, employing 80% of the population and providing 37% of GDP. Only about 20% of the total area is cultivable; another 33% is forested; most of the rest is mountainous. Rice and wheat are the main food crops. The lowland Terai region produces an agricultural surplus, part of which supplies the food-deficient hill areas. Even though China is the 2nd largest exporter to Nepal, yet unlike India which is the largest buyer of Nepal's goods, China's imports from Nepal are zero, thus burdening Nepal's monetary stability and monetary balance. The annual monsoon rain, or lack of it, strongly influences economic growth. From 1996 to 1999, real GDP growth averaged less than 4%. The growth rate recovered in 1999, rising to 6% before slipping slightly in 2001 to 5.5%. Modern education in Nepal began with the establishment of the first school in 1853. This school was only for the members of the ruling families and their courtiers. Schooling for the general people began only after 1951 when a popular movement ended the autocratic Rana family regime and initiated a democratic system. In the past 50 years, there has been a dramatic expansion of education facilities in the country. As a result, adult literacy (age 15+) of the country was reported to be 48.2% (female: 34.6%, male: 62.2%) in the Population Census, 2001, up from about 5% in 1952–54. Beginning from about 300 schools and two colleges with about 10,000 students in 1951, there now are 26,000 schools (including higher secondary), 415 colleges, five universities, and two academies of higher studies. Altogether 5.5 million students are enrolled in those schools and colleges who are served by more than 150,000 teachers. Despite such examples of success, there are problems and challenges. Education management, quality, relevance, access are some of the critical issues of education in Nepal. Societal disparities based on gender, ethnicity, location, economic class, etc. are yet to be eliminated. Resource crunch has always been a problem in education. These problems have made the goal of education for all a challenge for the country. ↑ "Regmi sworn as head of Interim Election Govt". The Kathmandu Post. 2013-03-14. http://ekantipur.com/2013/03/14/flash-news/regmi-sworn-as-head-of-interim-election-govt/368423.html. Retrieved 14 March 2013. ↑ "New cabinet holds first meeting". Republica. 2013-03-14. http://myrepublica.com/portal/index.php?action=news_details&news_id=51474. Retrieved 14 March 2013. ↑ "National Population and Housing Census 2011 (National Report)". Central Bureau of Statistics (Nepal). http://cbs.gov.np/wp-content/uploads/2012/11/National%20Report.pdf. Retrieved 26 November 2012. ↑ 4.0 4.1 4.2 "Nepal". International Monetary Fund. http://www.imf.org/external/pubs/ft/weo/2012/01/weodata/weorept.aspx?pr.x=46&pr.y=13&sy=2009&ey=2012&scsm=1&ssd=1&sort=country&ds=.&br=1&c=558&s=NGDPD%2CNGDPDPC%2CPPPGDP%2CPPPPC%2CLP&grp=0&a=. Retrieved 20 April 2012. ↑ "Human Development Report 2013 : Nepal’s ranking unchanged at 157". The Kathmandu Post. 2013-03-15. http://ekantipur.com/2013/03/15/headlines/Human-Development-Report-2013--Nepals-ranking-unchanged-at-157/368478/. Retrieved 15 March 2013. ↑ "hdr_2013_statistical_tables". The Guardian UK. https://docs.google.com/spreadsheet/pub?key=0AhORuxOwZhGydExmNFA3ai1XcWktUXpxeDNwMnlCX0E&output=html. Retrieved 15 March 2013. ↑ Buskey, Theresa. "II". In Alan Christopherson, M.S. (in English). History and Geography. LIFEPAC. 804 N. 2nd Ave. E. Rock Rapids: Alpha Omega Publications, Inc.. pp. 21. ISBN 978-1-58095-157-9 . ↑ "Highest mountains in the world". http://www.scaruffi.com/travel/tallest.html. Retrieved 2008-12-02. ↑ "Lumbini, the Birthplace of the Lord Buddha". UNESCO. http://whc.unesco.org/en/list/666. Retrieved 2 April 2013. ↑ 10.0 10.1 "Real Nepal - Population". nepalvista.com. http://www.nepalvista.com/realnepal/population.php. Retrieved 8 January 2011. ↑ "Final Interim Constitution of Nepal, 2063" (pdf). worldstatesmen.org. 2007. p. 2. http://www.worldstatesmen.org/Nepal_Interim_Constitution2007.pdf. Retrieved 14 October 2013. ↑ "Plants, Animals and Birds of Nepal". Nepal Vista. http://www.nepalvista.com/features/plants-animals.php. Retrieved 14 June 2013. ↑ "Regions of Nepal". Statoids. 2012-12-07. http://www.statoids.com/unp.html. Retrieved 12 October 2013. This page was last changed on 29 October 2014, at 20:21.